Although crime in the UK is generally on a downward trajectory, this is largely because the public have taken notice of police appeals to become more crime-aware. The same cannot be said of the student population, around one third of whom become victims of crime during their university careers. This is partly because students tend to own more portable electronics than most people and partly because they’re not renowned for being security-conscious. If universities want to improve records of campus crime, there are several key areas to target. In the excitement of moving to university and in the midst of an active work and social life, students may not always prioritise their own personal safety. The university authorities therefore have a role to fill if they want to make sure students stay as safe as possible. One very effective way to do this is to get students and staff involved in the promotion of personal safety as a grassroots responsibility. Many universities start the academic year with fun safety-themed events, run in association with the Students’ Union and other relevant authorities. These give information about the safest ways to travel back from nights out, fire safety, and sometimes distribute free personal alarms to students. 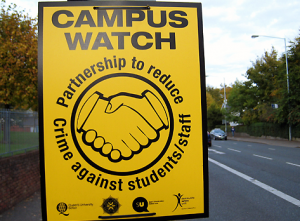 Another initiative proving to be very successful in universities throughout the country is Campus Watch, a scheme where staff and students liaise with the police and college security to improve safety on campus and around town. Campus car parks can be remote from other buildings and, since student cars are often older models, they may lack the security features that come as standard in more recent vehicles. The fact that a car is older and less valuable may actually be an incentive to an opportunistic thief, because such a car is often easier to steal and the owner frequently more sanguine about their loss. For this reason, CCTV is a must-have in university car parks, both for its deterrent value and its usefulness when investigating crimes that have already been committed. Cycle parks should also be covered by CCTV systems, and must offer secure, vandal-proof storage for bicycles and equipment. 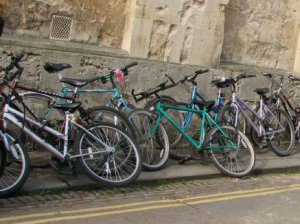 New schemes promoting the security tagging of bicycles are often incredibly successful at deterring theft, mainly because advances in technology have produced security devices that are almost impossible to remove. “Tags,” for example, are microchips embedded in shuttlecock-shaped devices, which are inserted into the bicycle frame via the seat post. This simple addition provides a unique serial number that can be registered to the cycle’s legitimate owner. The cloistered atmosphere of the university campus is notorious for lulling staff and students into a false sense of security. In the seemingly secure environment of a university library, even typically cautious students can become lax, putting laptops and other personal belongings at risk of theft. Simple access control systems such as those operated by magnetic swipe cards can go a long way towards reducing easy pickings by outsiders. Theft and vandalism in student accommodation runs at incredibly high levels, aided and abetted by the 30% of students who regularly leave their accommodation unsecured when going out. Here, educating the student body on the importance of simple security is probably the most effective step a university can take. Students should also be encouraged to insure their valuables against theft, and to prominently mark items with their initials and postcode to make it harder to sell them on. One important crime prevention measure is to make it easy for students to report crime. Although the first port of call for any victim of crime must be the local police, students should also be encouraged to approach campus security. They will be much more likely to do this if the security staff already have a profile among and are trusted by the student population. Such a profile can be gained by uniformed patrols of the campus, especially areas that may be secluded or vulnerable to crime, and by participation in campus safety events such as those typically held at freshers’ fairs. Also, universities should consider the use of covert patrols, as these can be helpful in preventing certain types of offence. One third of students will be affected by crime during their time at university. Fortunately, the majority of campus crime is directed at property, but this can still be inconvenient and even devastating. Universities can and should do more to help students stay safe and secure on campus. Broadsword Security is committed to help you keep your property safe with our range of alarm systems and security gates. To find out what can offer you for your home or business premises please call us on 01608 641670 or contact us here.